The next game I'll be reviewing won runner-up for Best Multiplatform Game at the SPC Best of 2011 Awards, so you know it's of quality. If you have any hesitations in picking this game up, stop it and run to your local game retailer of choice. Toys 'R Us had been selling the game at the drastic price of $19.99. My pleas aside, here's my review of Rayman Origins which is also coming to Nintendo 3DS and the PlayStation Vita. The 2D platforming genre has seen a bit of a resurgence as of late with everyone from Nintendo to Capcom to indie studios producing and developing games cut from the same 2D cloth. 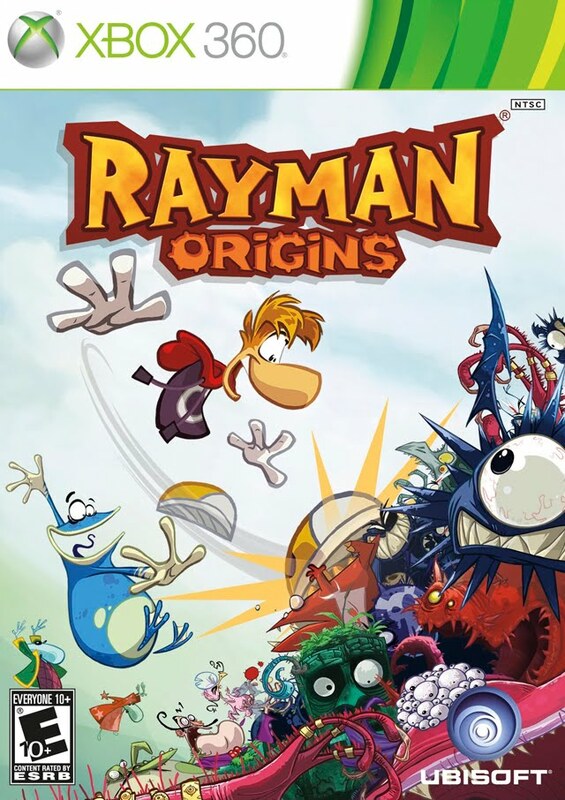 After an extended hiatus and a profusion of games starring the precocious Rabbids, Rayman is finally returning to the spotlight and starring in his own game, Rayman Origins. Coming from Ubisoft of all places who are not known for their high quality games of late other than Assassin's Creed, Rayman Origins is certainly one pleasant surprise worthy of your gaming time. Rayman Origins starts out with the limbless hero and his trusty friend Globox resting heavily in their home in the Glade of Dreams. However, when their loud, obnoxious snoring bothers their downstairs neighbors in the Land of the Livid Dead, all-out war begins! The villains then capture the small creatures known as Electoons in small cages and imprison the ability-giving Nymphs as well. Rayman, Globox, and two Teensies all join up to explore worlds big and small to right the wrongs of the patrons of the Land of the Livid Dead so they can get back to what they love doing-- resting and snacking back at the Glade of Dreams! 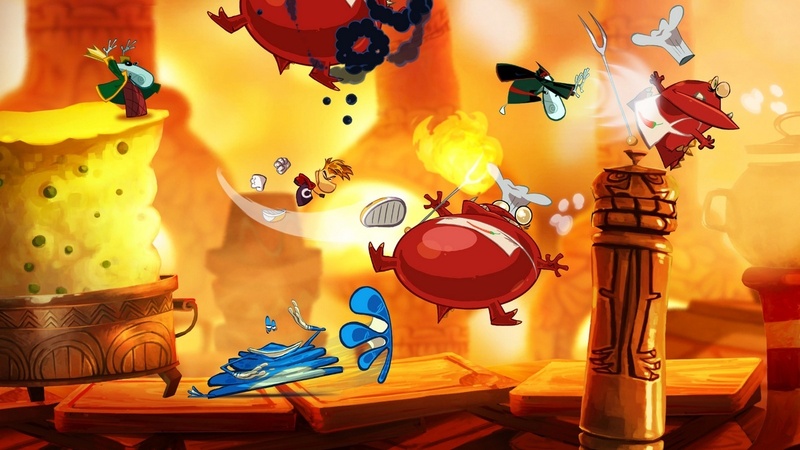 The story of Rayman Origins is unobtrusive for the most part with small portions of dialogue scattered throughout the game. 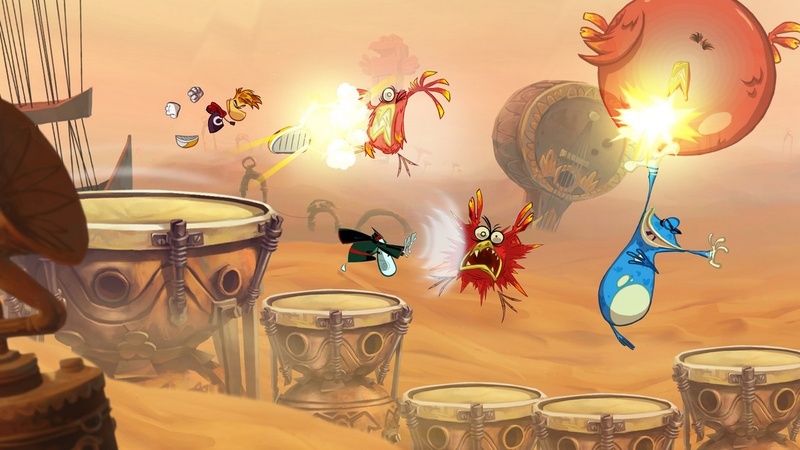 Most of the time, though, actions speak louder than words, and that is the case with Rayman's latest adventure. 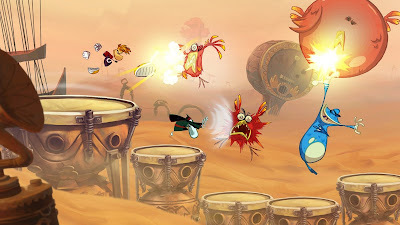 Rayman marches to the beat of a different drum. No matter which character you choose, they all have the same amount of moves at their disposal. 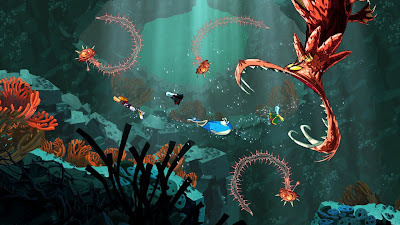 As you progress through the game and rescue Nymphs from their cages, they teach you new moves such as the ability to hover for a limited amount of time, the ability to swim, to run up walls, and to shrink at specially marked locations. There are four characters to select from: Rayman, his overweight buddy Globox, and two Teensies. There might be some small differences between characters, but it's nothing major. You can sprint, slap enemies or other players even, wall jump, and of course since this is a platformer, leap into the air onto platforms and enemy heads. 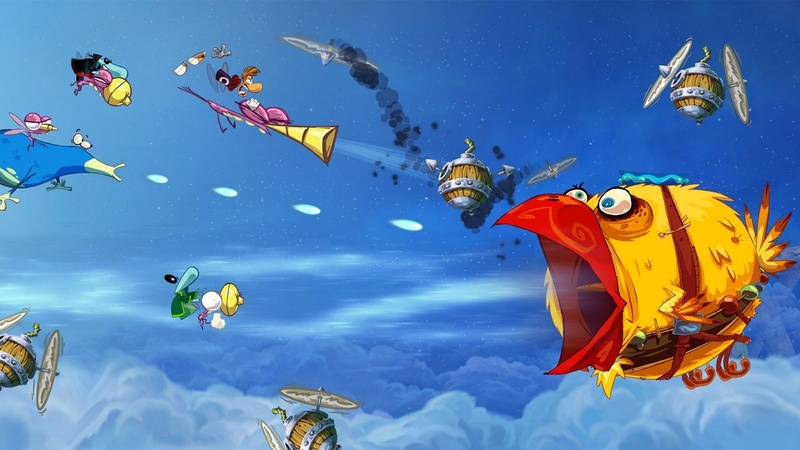 Like New Super Mario Bros. Wii and LittleBigPlanet, Rayman Origins allows you to team up with up to three other players and venture through the 9+ unique worlds and 60+ levels the game has to offer. Players can interact with one another by slapping each other. This can actually help by giving you extra height during a jump to reach otherwise-inaccessible items and areas. When someone perishes (you can only get hit once before you die unless you are carrying a heart), they turn into a bubble a la New Super Mario Bros. Wii. Unlike that game, however, you can control the bubble 100% completely and have your alive friends rescue you. If all players end up inside bubbles, you begin from a checkpoint, and as there are an ample amount to be found, retrying areas of the game is never a chore. Playing with friends is much easier than playing alone as there's a much wider margin for error when teaming up. Unfortunately there is no online play to speak of which is a huge oversight. A game like this begs to have online play. Regardless, get a roomful of buddies, and you're bound to have a slap-happy good time. The first five worlds are played in a linear fashion, but once you clear that fifth world, you gain the choice of going to any of four worlds. You get to clear them in any order you wish. The levels are highly creative, ranging from deserts full of instruments like drums, oboes, and guitar strings to frozen glaciers infested with deadly fruit. Each level introduces a new gameplay element to spice things up. One level you'll be cautiously avoiding being squished by gears, mashers, and pistons while another you'll be running from a incredibly hungry creature or flying on top of mosquitoes (these on-rails shooter segments occur in every world). In this regard Rayman Origins reminds me very much of Donkey Kong Country and its three sequels. These shooter segments break up the platforming gameplay. The comparisons to Donkey Kong Country don't end there, either. In each level there are Electoon cages hidden away in bonus rooms. These are hidden in fiendish locations usually just off the screen in a secret area of a level, but the faint cry of "help me" usually assists in knowing the coordinates of a bonus room. In these bonus rooms the goal is to clear out every enemy and then bust open the cage to free the Electoons. There are three cages in every platforming level with two being in hidden rooms and the third being the conclusion of the level. Apart from Electoons, there are Skull Coins found in hard-to-reach, dangerous, or hidden locations in the game's levels. If you can manage to hold onto them for a few seconds, you'll earn twenty-five Lums (pronounced "looms"). Lums are yellow specs of light that are like the coins of the Super Mario Bros. series. The point of Lums is to gather as many as possible so at the end of a level you earn Lum Medallions for reaching a certain total (100, 150, 200, 250, 300, etc.). Collecting enough of said medallions opens the way to the most challenging levels in Rayman Origins. Now I know what a tin can feels like! 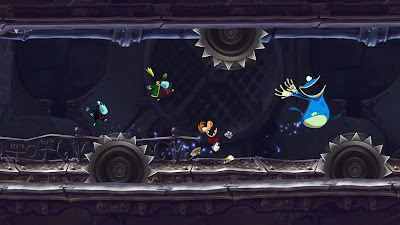 These levels have you chasing after a rogue treasure chest who flees from Rayman and friends when it gets the thought in its head that our heroes want to clobber it open. The trick to these levels is to constantly be at top speed as you navigate falling platforms, deadly obstacles, and try to keep up with the treasure chest until the conclusion of the level. Catching up with the treasure chest nets you one of ten Skull Teeth. When all ten have been collected, the way to the most difficult world in the game, the Land of the Livid Dead, is opened. These treasure chest levels are mostly about trial and error as well as high precision platforming. One small mistake can be the difference between victory and defeat, but the levels are built around the idea of "just one more try" and "almost have it" that repeated tries are never too annoying. The skills you get from completing these levels assist you in the main game. Not all is well with these levels, however, as one early level has a glitch near the tail-end which can instantly kill all players if the jump isn't exactly right. This caused a lot of frustration, and there's no excuse for it. How could the developers not find this? Moving on, the first half of the game does not feature many bosses at all, if any. Instead the game slowly introduces you to new gameplay concepts and trials. It's a steady challenge and a fun adventure. When you reach the second half, however, that is when each world concludes with a traditional three-hit-and-they're-dead boss battle. Each one has you dodging the boss's attack, and then hitting the giant sore that stands as its weak point. One battle has you hovering in the air while avoiding being sucked up by a colossal cuckoo bird while another has you fighting inside the belly of a beast with a severe and hazardous case of heartburn! The encounters are enjoyable enough and divides up the game quite nicely. The boss fights are your typical three hit affairs. After a level has been finished, you can opt to try out a Time Attack challenge. These have you racing against the clock and competing to best a set time. You earn a medal for each time you successfully beat. Between trying to finish the Land of the Livid Dead and gathering every Electoon Medallion, there is no shortage of things to do in Rayman Origins. 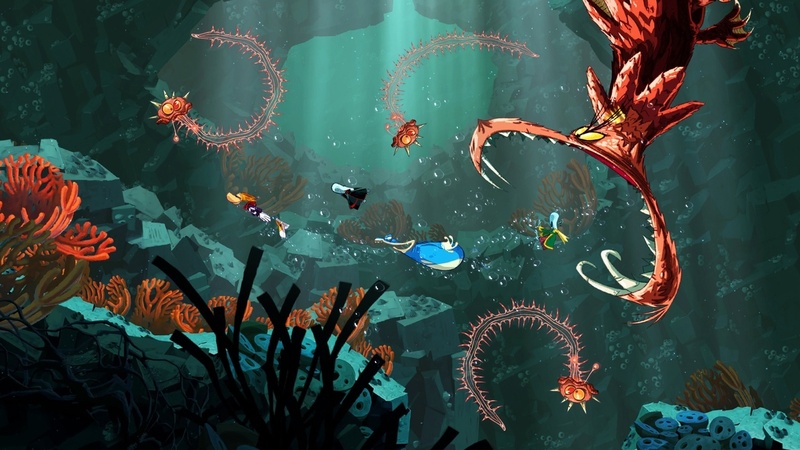 There is no question that Rayman Origins is one gorgeous game. Using a new graphics engine, the UbiArt Framework, has allowed Michel Ancel and his team to create lush worlds teeming with beautiful backgrounds and crisp and colorful characters. The fact that it is all hand-drawn is astounding as well. If you needed a pick for the "are games art?" debate, you should definitely choose Rayman Origins as your evidence. The game's soundtrack is as crazy and insane as the visuals of the game, featuring vocals (Chipmunks, anyone? ), percussion, brass, and a myriad of memorable melodies that you cannot help but bop your head to. Case in point, Rayman Origins delivers and delivers big time. Leave it to Rayman to slap some sense into his enemies! Rayman Origins is a nice cross between New Super Mario Bros. Wii and the Donkey Kong Country series in that it has awesome local multiplayer play, it constantly introduces new gameplay mechanics into the fray, and the presentation is without a doubt one of the best-- if not the best-- of 2011. From the "just there" story to the ingenious level design, Rayman Origins is sadly an overlooked gem that should without question be in every serious platforming fan's library. 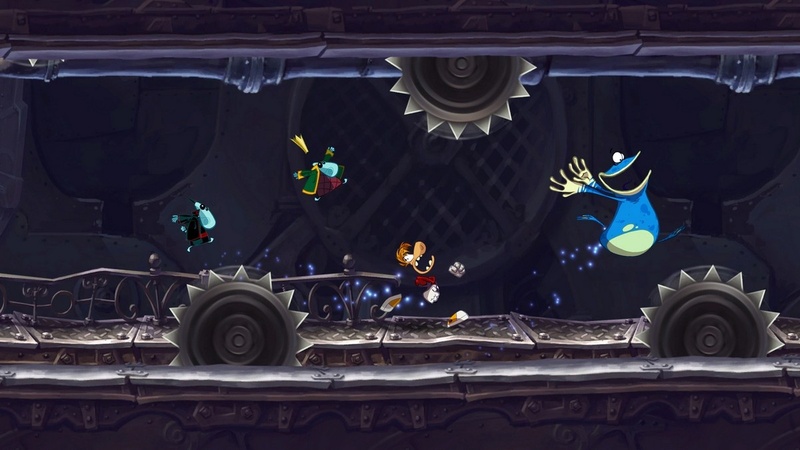 Rayman might not have limbs, but he undoubtedly has heart. I bought this game early in the month but haven't gotten around to playing it. From all the acclaim this game has gotten, I have only one question: why aren't more people playing this? At least in North America the ads were relegated to magazines. That was it. Nothing else. Plus it was sent to die by Ubisoft during the holiday season.